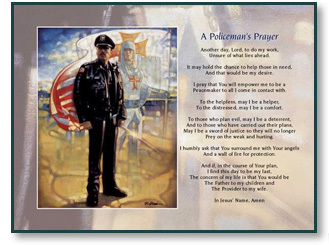 "I tried to think of a historic symbol to paint that would, in my opinion, epitomize the police officer of today. The one I chose is a Crusader, holding the flag with the symbol of his mission, the Cross. Nothing said it better, and nothing could say it better today. The ultimate Peacemaker was the very Son of God who allowed Himself to be hung on a cross to make peace between two isolated parties. Do you know who those were? God was one, and you and I were the other! Christ brought us together and made peace between us. Isn’t that what police officers imitate every time they are confronted with a lawbreaker? Ultimately, I believe it is, and once again our example comes from the greatest who ever lived, Jesus Christ!" 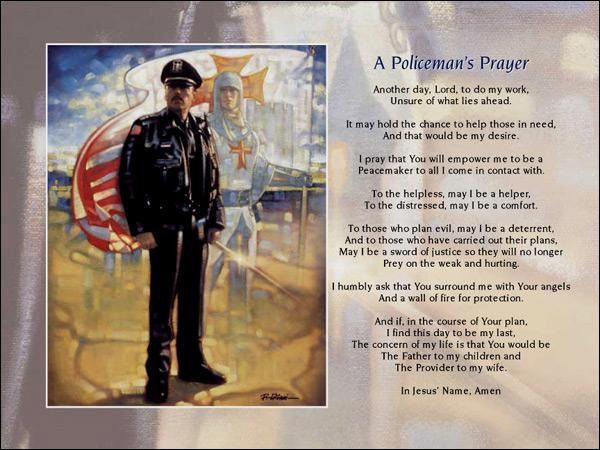 A Policeman's Prayer copyright © 2002 by Ron DiCianni is prohibited from being copied. All applicable © laws apply and are reserved by artist Ron DiCianni.